During the early morning of Thursday 8 March 2012, the day of the Holi festival, many thousands of people assembled at Vaghjipur Chokdi, the centre of the village, to take part in the grand procession. At exactly 8.00 am, Acharya Swamishree arrived and presided upon a golden chariot. A helicopter circled the procession and showered fragrant flower petals over everyone. Senior sants and disciples garlanded Acharya Swamishree. The route of the procession was 5 kilometres long. Disciples lined up along the route. There were so many people that from the time that the procession commenced, the front reached Vaghjipur temple, whilst Acharya Swamishree’s chariot was still at Vaghjipur Chokdi. An estimated 100,000 people had lined the route for the divine darshan of Acharya Swamishree and the procession. Apart from Acharya Swamishree’s chariot was a golden chariot upon which presided Lord Shree Swaminarayan, and another for Jeevanpran Shree Abji Bapashree. The replica aeroplane, Shree Muktajeevan Airways, also taxied along the route. Sixty disciples of Panchmahal, in their traditional attire, carried bows and arrows and danced during the procession. In addition, there were 60 disciples carrying swords, and another 60 carrying swords. An open back lorry carried young disciples who danced to devotional music. Behind Acharya Swamishree’s chariot, a group of girls also danced throughout the entire route. Shree Muktajeevan Pipe Band London performing patriotic and devotional melodies was another main attraction of the procession. As it was the day of Holi, large branches of the ‘Kesudo’ flower were carried by disciples along the route. It is from this flower that the traditional yellow/orange colour used for the Holi celebrations is made. The procession passed Vaghjipur Primary School, and eventually reached the temple at 1.00pm, five hours after its start. There were so many people that it was difficult to walk along the route. Throughout, Acharya Swamishree showered onlookers with prasad. When the procession reached the festival assembly marquee, Shree Harikrishna Maharaj and Acharya Swamishree were ceremonially welcomed and led onto the stage. The atmosphere was electric due to the uncontrollable joy and love that was evident in everyone. At the end of the procession, all the people were given prasad. So many people came to eat on this day that it became impossible to keep a count or make an estimate. However, the festival kitchens have reported that they used 3 tonnes of salt in making the food. During this festival, you have all witnessed the true devotion that exists in the disciples. Such dedication and spiritual love exists only at Shree Swaminarayan Gadi; and all that is due to the unsurpassed compassion and grace of Jeevanpran Swamibapa. When Swamibapa first came to this village, there were no facilities; no proper roads, houses, or infrastructure. Flies and mosquitoes were in abundance, and ready to bite everyone. The disciples felt ashamed that Swamibapa had to remain in such conditions. However, Swamibapa did not take any notice of this because all that He could see was the profound, genuine love of the people. Such genuine devotion is still being seen in the people here. The people who have come here from around the world are having to confess that they may be richer than these people in a monetary sense, but spiritually, the people of Panchmahal are far more affluent. Lord Shree Swaminarayan had started to shower His divine grace on this region many years ago. It used to be referred to as the 'Zadi' region, because of the abundance of forestry (Zad) that existed here. 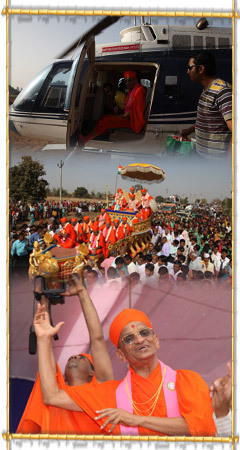 Lord Shree Swaminarayan sent His beloved spiritual heir to tour the region with sants. However, there were many wild animals living in the forests. To protect the sants from the wild beasts, Shree Gopal Bapa would draw a circle in the ground around where the sants were sleeping. By Gopal Bapa's prowess, no animals were able to enter the circle. In this manner, Shree Gopal Bapa protected the sants. When Lord Shree Swaminarayan, in the guise of Shree Nilkanthvarni, was in His forest expedition, He met Gopal Yogi. The people of that region were being attacked by wild animals. They came to Gopal Yogi for protection. However, he said that there was nothing that he could do. Shree Nilkanthvarni heard the desperate pleas of people and gave a conch to Gopal Yogi and said, 'Blow this conch. The animals will flee from wherever its sound can be heard. In the same manner, Jeevanpran Swamibapa has showered His divine grace here. During the procession held this morning, the sound of devotional songs, music, chanting of the Swaminarayan name, etc. could be heard for miles. Wherever all this devotional sounds resonated to, will be protected from spirits, ghosts and apparitions. By Swamibapa's prowess, no such evilness will be allowed to enter the region. You must maintain control of your personality so that it does not dictate your behaviours. Your conduct should remain in line with the will of Lord Swaminarayanbapa Swamibapa. Remain humble and listen to the advice of sants, because they know the manner of pleasing the merciful Lord. A person who conducts his manner of thinking and behaviour in this way has no fear; and he will progress day by day within the Faith. After the divine blessings, a special event was held to mark the golden jubilee of our beloved Acharya Swamishree's Diksha as a sant. At the tender age of 19 years, 9 months and 23 days, in Samvat 2018 Fagan Sud 15 (Sunday 21 March 1962), Gurudev Jeevanpran Shree Muktajeevan Swamibapa initiated Acharya Swamishree as a sant and named Him Swami Purushottampriyadasji, i.e. He who is beloved to Purushottam....the supreme Lord Shree Swaminarayan. Exactly 50 years after that event, Acharya Swamishree's Diksha Golden Jubilee was celebrated by sants and disciples in Panchmahal. Acknowledging the requests of sants and disciples, Acharya Swamishree presided on a swing decorated with fresh flowers. Sants and young disciples performed a splendid devotional dance around Acharya Swamishree. Senior sants and disciples then performed adoration to Acharya Swamishree. Everyone in the congregation were given small lamps and a communal aarti was performed to mark the golden jubilee. A drama production, Swamibapa Taranhara - Swamibapa our Saviour, was performed by sants and disciples of Panchmahal. The story retold the dire situation in Panchmahal 60 years ago. Scenes depicted how Swamibapa first came to the region and how His teachings and spiritual love transformed Panchmahal; and how, by Swamibapa's mercy, the people have progressed in all respects. It also showed the immense work that Acharya Swamishree has done for the regeneration of Panchmahal.